An inquiry into the images of begging and giving 2011 to 2016. 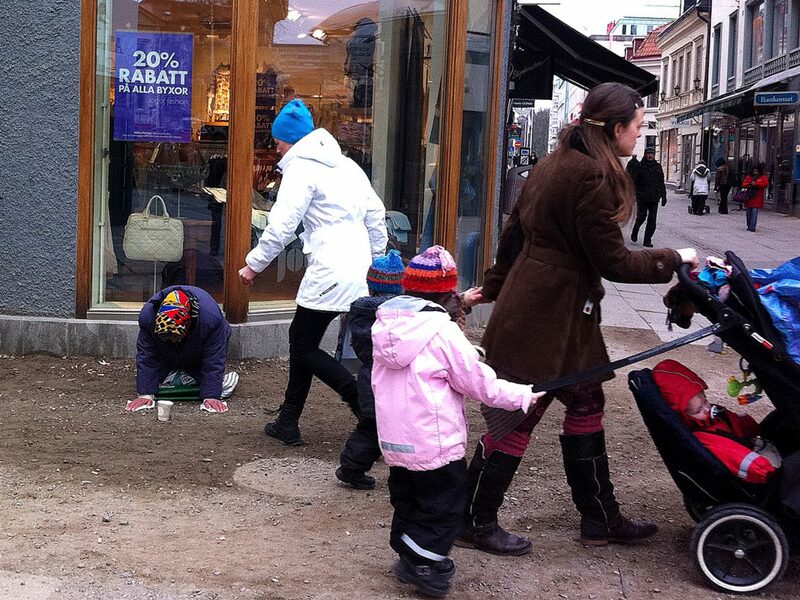 Cecilia Parsberg’s first encounter with a begging person led her to spend five years investigating the new situation regarding begging and giving in Sweden. The premise is that every-day actions and reactions to another person can be made visible through aesthetics with ethical underpinnings. Her investigation takes place mainly in the urban landscape and in the media. – Which images are at play in the social choreography of begging and giving? In this context, how can images be activated in new ways? How can new images be generated? She also believes that begging is a call to social interaction, and regardless of whether the giver interacts socially with the begging person on the street, the giver is implicated in the asymmetrical value systems of the European Union. – In my first staged work I hire a professional market researcher to find out how a beggar in Sweden should behave to be successful. This becomes a film that I then show opposite another film in which begging people talk about how givers give. 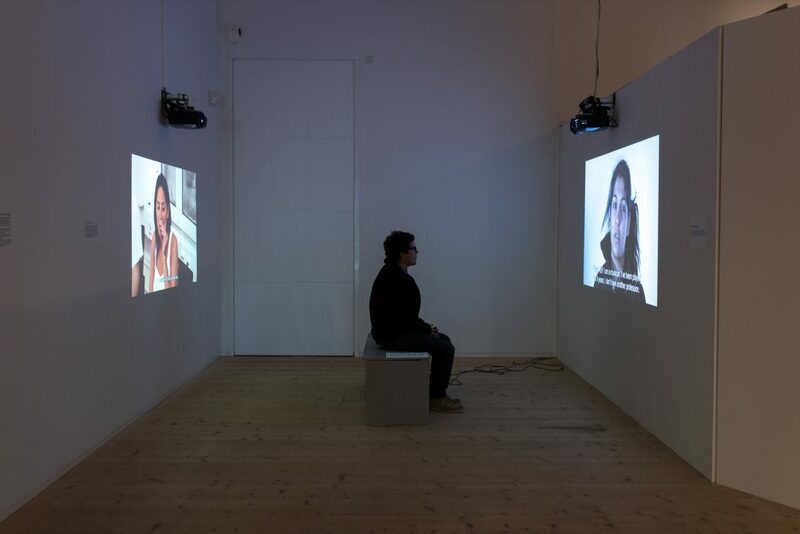 This is followed by a number of staged works and an interdisciplinary theoretical discussion involving, among others, Judith Butler, Sara Ahmed, and Hannah Arendt, as well as a number of artistic works concerning how images – and bodily actions – are linked to the social image and the body politics. The arrangement of the choirs in the staged work The Chorus of Begging and The Chorus of Giving, indicates a space for social interaction and thus demonstrates a different order that demands different actions in terms of language, movement, and attitude toward each other. – It’s a social choreography: when the choirs rehearsed and sung together a political form emerged. My hope is to make visible a space for action between the begging and the giving that can be used for continued ethical negotiations and new staged works. Solo exhibition at Skellefteå Konsthall, 30/10, 2016 –22/1, 2017. 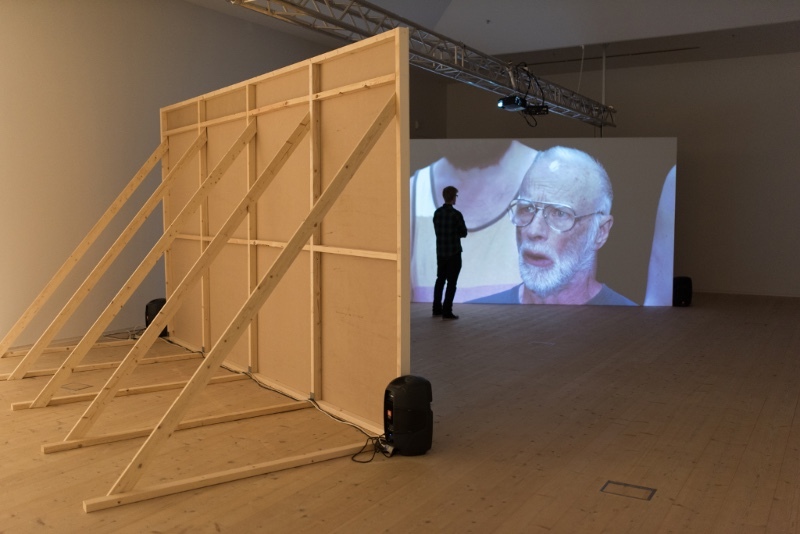 Solo exhibition at Varbergs Konsthall, 3/10, 2015 – 10 Jan. 2016. Solo exhibition at Reflektera Konsthall, Väven, Umeå, 11/4–17/5, 2015. Group exhibition, MOTBILDER, public places, Göteborg, 23/8–14/9, 2014. Each exhibition holds an open panel discussion with local politicians, civil organisation, and researchers. Photo from Varbergs Konsthall. Look at This interview filmed by a TV-team from Rumania and parts of it was broadcasted there in May 2015. In The Chorus of Begging participates people who beg on the streets. In The Chorus of Giving participates people who usually give to those begging on the streets. They sing – without words or music – feelings between begging and giving people. The political happens every day, between people in my neighborhood, people who share my existence. It is the very foundation of my artistic work. I see and feel a physical and mental distance between those on their knees on the street and passers by, between begging and giving people. The viewer is invited into that space “in-between”. There is a dialogue, or lack of dialogue, between the two choruses; between voices, facial expressions and bodies. The installation The Chorus of Giving and the Chorus of Begging is an embodiment of this experiential space. A mirror of the situation that everybody can experience on the street and refer to in their day-to-day lives. It is my hope that art will make visible this in-between space – which seems difficult to talk about – as a space for action; and thus contribute to the possibility for political action in and about this space. The process of creating a choral work together these three days was also filmed and became a production film with an accompanying text where, among other things, ethics, aesthetics and work conditions are described. The piece has been shown in a number of public places and at seminars. It’s a visualisation of how it’s possible to create space for action. It shows both method and result. There is a space of action between us. Art is a way to utilize this space to express the sensual, that which also is the basis for the political: in the affects and reactions in people. If art is about visualising this space of action then the political is about how it is possible to see which images that are relevant in this space, and to activate it. There is a drama on the streets between between those who beg and those who give, or don’t give. Often both parties appear to want to communicate more, but can’t. The barriers are both emotional and due to language, and many cultural codes are at play. 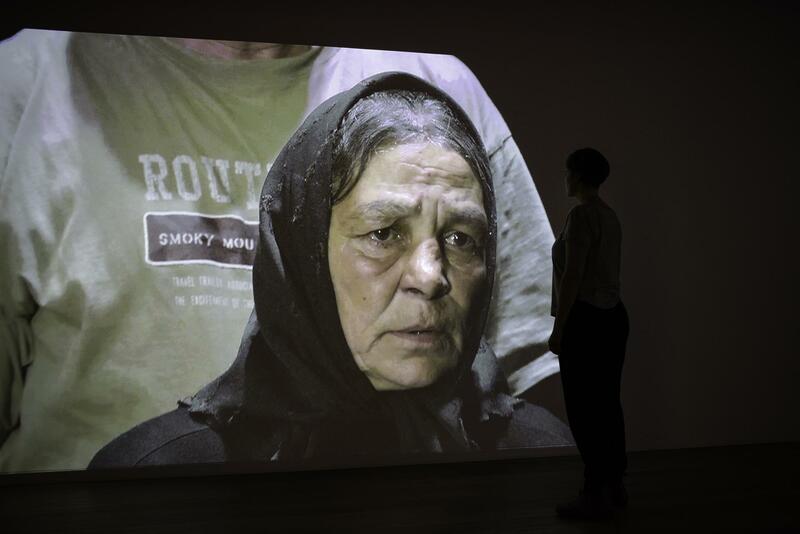 Images of each other, often generated by prejudice and ignorance, are set in play. These images we have – how we picture one another – need to be negotiated, as these images today create a violence against humans. Last spring, I made contact with people begging on the streets and people who sometimes give to those begging, to ask them to sing – without words or music – the emotions between begging and giving people. The two choruses should stand opposite each other and sing in response to each other. Three days of chorus training, with chorus director Jenny Roos and musician Pär Hagström, resulted in The Chorus of Giving and the Chorus of Begging, a filminstallation for two screens where the viewer stands between. 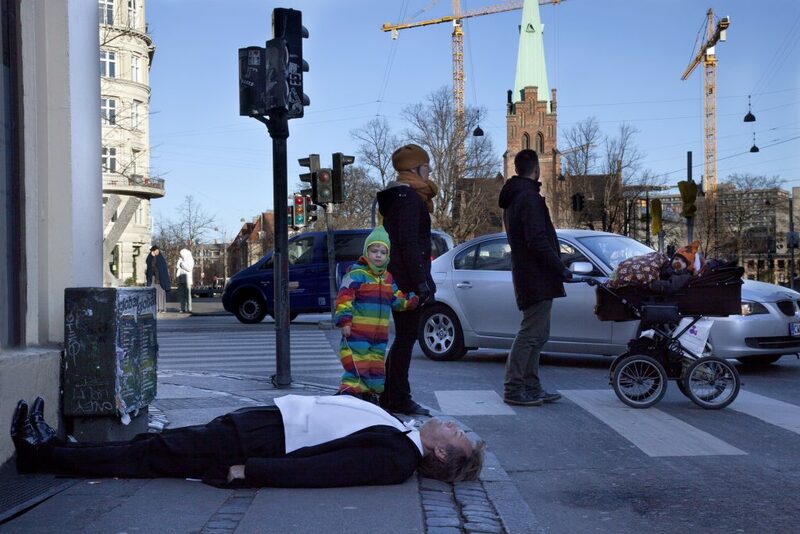 It’s a dramatization of what is happening everyday on the streets in Sweden. To give and receive money is often a non-verbal transaction, which is why The Chorus of Giving and the Chorus of Begging sing without words. Chapter 2.2 What Images does the Giving face? & What Images does the Begging face? These two films are screened opposite each other. For the viewer in between ”images” – collective as well as individual, visual as well as linguistic – emerge, images that are set in play in the society in every meeting between giving and begging people on the street. With what eyes do I see the begging person; what images are ”given” and which images can I make by what happens? With what eyes is the begging person seeing the giving person? We all have unconscious mental images deriving from values produced by the national culture, structures, decision processes and institutions but many performances are interchangeable, they are possible to destroy and it is possible to create a new image. Inför vilka bilder sker tiggandet? & Inför vilka bilder sker givandet? Med vilka ögon ser jag på hen som tigger; vilka bilder är på förhand givna och vilka bilder kan jag göra av det som sker? Med vilka ögon ser den som tigger på givaren? Vi bär alla på omedvetna mentala bilder som härrör från värderingar producerade av nationell kultur, strukturer, beslutsprocesser och institutioner men många föreställningar är utbytbara, de är möjliga att förstöra och det är möjligt att skapa sig en ny bild. 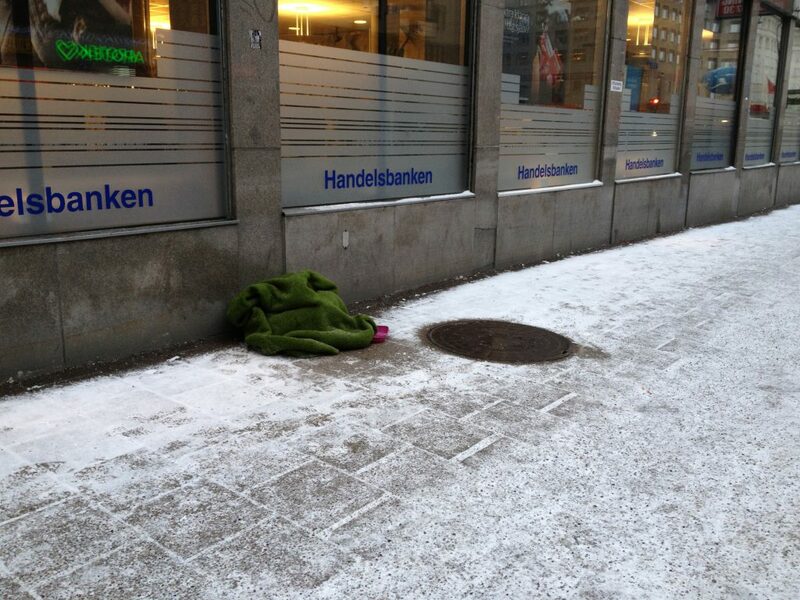 “Sleeping places in central Stockholm, January 2015” is a series of photographs of some of the many sleeping places that are furnished on the streets. I feel like I am looking straight into bedrooms without walls, ceilings, beds, and closets. It’s a space that should be private. “Closets on the Street” is a series of photographs that shows how bedding and belongings are stored during the day. A selection of 30 photographs, snapshots from 2012-2015 when I passed by. Perhaps the begging person has gone for lunch with their friends and family. They have told us they tend to gather and share so that everyone gets food. A selection of 22 photos generated in an an ongoing photo-demonstration with and by giving people. The begging is fairly new entrant into the street space and there are many who do not know how to relate to this, physically and mentally. How does it feel? I experience a distance, almost a chasm between me and those who are begging. Overall, it feels like the street’s atmosphere has changed; something has happened in the social climate that feels substantial and yet not defined. Is it solidarity, the ability to be touched? How does it feel for you? Would you like to participate? Every exhibition an open community workshop is held by the artis and the new photographs become a part of Body on Street, the exhibition. 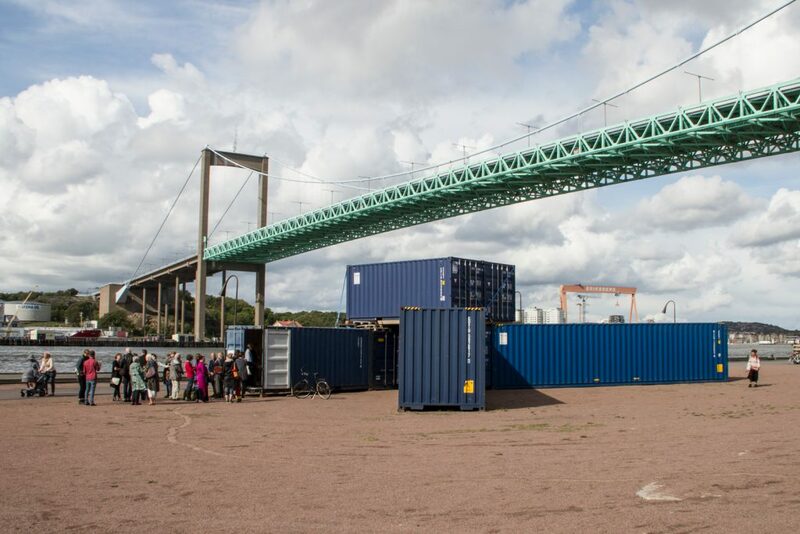 The chorus installation had it’s first screening outside, in six containers during three weeks. Swedish Radio made a reportage (30 mins) during the whole work-process. TV showed the installation in Kulturnyheterna, (SVT, 22/8, 2014) and it gives an idea of thephysical experience of the installation. A film ”On the production of the Chorus of Begging and the Chorus of Giving” is screened in the entrance-exit-container, (58mins). The film is a documentation from the training and interaction of the choirs, day by day. A text belongs to the film where I describe the practical and theoretical context. Contact me if you would like to know and see more. The chorus work alone is also shown as street-screenings, and the soundtrack is released on Spotify 02.2014. The lecture is published at Socialmedicinsk tidskrift.